For a bit of fun and revision I'm doing a couple of free courses currently available from open2study.com that may be of interest to my readers. One course teaches the basics of financial planning #O2SFinPlan , and another free course covers the basics of financial literacy #O2SFinLitrc . Both courses started last week, but you can enrol at any time before the course ends and should be able to easily catch up. Each week covers a module via a series of ten short video presentations, and a short multiple-choice assessment quiz at the each of each week. If you complete the course and achieve at least 60%, you will get a statement of completion to print out. 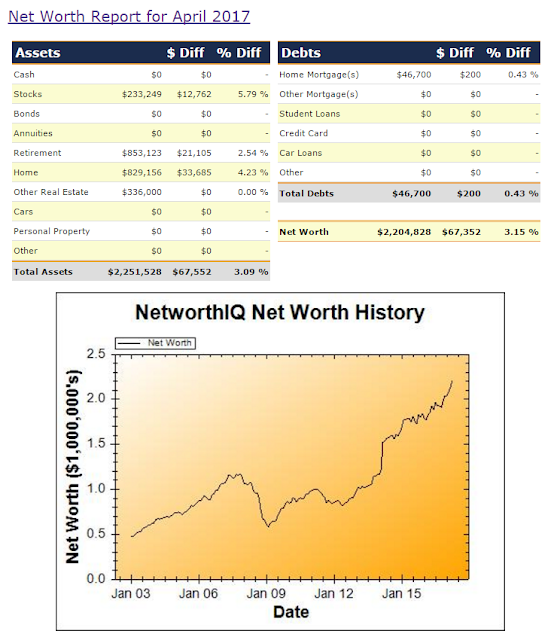 A buoyant stock market and Sydney real estate market boosted my net worth again last month - my geared stock portfolio was up 5.79% ($13K), my retirement savings up 2.54% ($21K), and the estimated valuation for our home rose another 4.23% ($34K) despite Sydney real estate prices levelling off during April. Local factors (the announcement of 'NorthConnex', and the pending completion of the Northern Beaches Hospital) meant our suburb showed continued appreciation in real estate prices last month. Overall, my NW increased 3.15% ($67K) during March, which is comparable to my annual after-tax salary! Last time things were going so well was just before the GFC, and my NW chart is starting to look a bit like a 'bubble'. Last month I toyed with the idea of purchasing a commercial (office) property in Forster (near our lakeside 'hobby' farm) as an investment, with potential to use to office for my own financial planning business when I 'retire' to the countryside. However, although the rental yield was quite good (~5.5%) on the two offices I was considering, the 'outgoings' (strata levy, rates, sinking fund) were considerable (of a similar magnitude to the rent). So, while the rental income would have been sufficient to pay the mortgage interest, and the tenant would be paying 75% or 100% of the 'outgoings', during any periods of vacancy it would have been a money pit. And an office in a country town can be very hard to let if there is a recession... So, in the end I decided to forget about investing in an office, and instead I'll use any spare cashflow to slowly paydown my existing investment loans. Last month I added some Tesla share CFDs to my CFD account, as it seems to have considerable potential as a speculative investment. My total CFD account only has ~$1000 invested, so it is basically just a 'plaything' I can dabble with when I get bored. I want to leave my share portfolio and superannuation investments generally unchanged, as trading costs can be a huge drag on overall investment portfolio performance. DW is still looking for a full-time position, and in the meantime is earning a few hundred dollars each week working a few hours each day as a 'nanny' for a local professional couple.